A major challenge facing many industrial companies is how to get more use out of their storage tanks. Often companies simply purchase new tanks without trying to repair or restore their existing tanks. However, what many companies may not realize is that sandblasting provides an easy way to repair and restore their tanks to almost new condition. Sandblasting is a time and cost-effective method for maintaining and restoring existing tanks. Sandblasting is the process of shooting a gritty, particle-based medium such as sand, glass beads or aluminum sulfide onto a hard surface to sand or polish it smooth. There is a variety of purposes where sandblasting can be useful. It can be used to clean pollutants or remove rust from storage tank walls or to prepare them for repainting or recoating. Sandblasting is an extremely versatile process because of the many types of mediums that can be used. For example, a more delicate tank lining may require a gentler sandblasting medium such as walnut shells or glass beads. Tougher jobs, such as those found in oil storage tanks or where the tank surface must be stripped to bare metal may require a more abrasive medium such as silicon carbide. Including installation, a new tank could cost more than $20,000. However, an existing tank of the same size can be sandblasted, have its leaks welded and then be repainted for under $4,000. This is less than 25 percent the cost of a new tank. You can add five to 10 years to the lifespan of tanks by choosing to have them sandblasted. Most sandblasting mediums can be reused multiple times. Glass beads are often recycled from glass bottles and may be used for sandblasting up to 30 times. Other mediums, such as silicon carbide, may also be reused multiple times. Some of the mediums used can be made from byproducts produced with a water jet cutting process used in some metal fabrication shops. This further reduces their cost. An added advantage with some mediums, such as walnut shells, is that they are fully biodegradable, thus saving money on their clean up and disposal costs. It is possible to save time and potential headaches that come with buying a new tank or replacing your old one. It can take months to fabricate, transport and install a new tank. 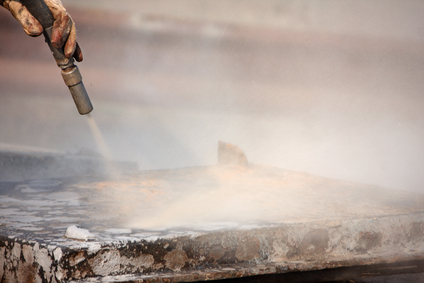 In many cases, the entire sandblasting process from site preparation to cleanup can be completed in less than a week. The most abrasive sandblasting mediums can further reduce downtime because they can achieve the same results as softer compounds but in less time. Most sandblasting companies are full service and take care of all aspects of the process, including other repairs that may arise and site cleanup. This helps alleviate hassles you might encounter trying to coordinate a new tank install. As a result, sandblasting effectively reduces your usage downtime because your tanks are out of commission for a shorter amount of time than they would be if you chose to replace them. With sandblasting, your old tanks can be restored to their former condition, quickly and inexpensively. This can be beneficial if your tanks are located in a visible location or an urban area where old rusty tanks might be considered eyesores. We have actually been discussing doing the exact opposite of what you recommend here, and getting a whole new tank to replace the old one. However, after reading this it makes much more sense to simply sand blast the whole thing. Originally it sounded like something that could take a long time, but if it really does take only a week then we will get started on this right away.